and my thoughts on what is going on in the world. This will be my last post on this blog. Several weeks ago, I decided to move to WordPress and host my own blog. My new home is Scribbles and Musings. I hope to see you there. Tell me I am not the only one who has this problem. I have so many ideas for things I want to blog about that I can't decide what to do next and so I do nothing. Surely I am not the only one with this problem. For instance, I have a couple of followup blogs posts I want do do as far as podcasts and the Roku Box goes. I also really want to share with you how I feel about Walmart photo printing. lol I did manage to successfully complete Project 52 last week, but I have yet to post the photos. I have new stuff from Merkeley Designs that I want to share with you. And a new layout that I really like how it came out, so I need to share it. But it's been several days since I've posted anything. So, am I the only one with this issue? Am I the only with so many ideas on what they want to do next that they do nothing? Let me know if I am the only one with this issue. Once again, it is time for another Playgroup at FunkyPlaygroundDesigns. This month, the Playgroup is inspired by the Academy Awards. 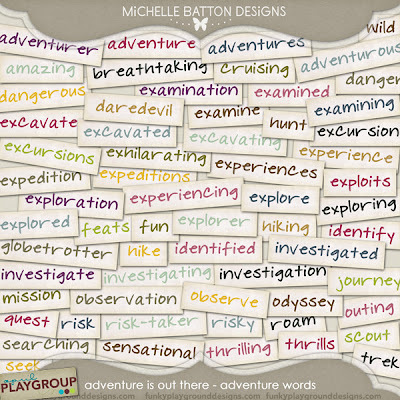 And Michelle Batton has created an amazing collection of products for this Playgroup called Adventure is Out There. If you have any travel adventures to document, or just want to create some All About Me layouts regarding trips you wish to take, then this is the collection for you. 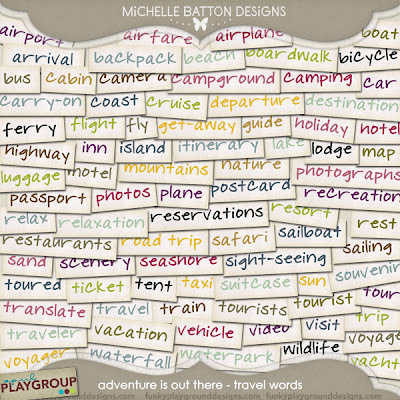 Michelle has create a full kit, two sets of word strips, an extra alpha and a set of lists that you can use to create some wonderful layouts. I have to tell you that Michelle was really inspired when she was working on this. And until April 18th, each of these products is available for 50% off. I don't know about you, but I love a 50% off sale. (My Paypal account can confirm that. lol) But that is not the end of the deals Michelle has for you. 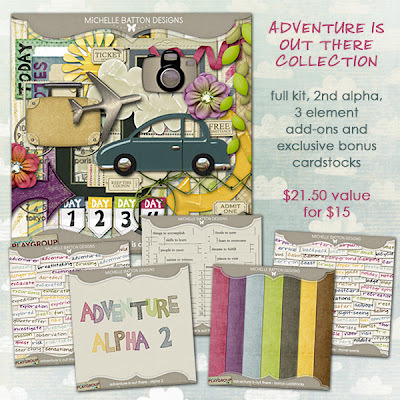 Michelle also has an Adventure Is Out There Collection that contains all of the above products, plus an extra set of cardstocks that is only available in the collection. Through April 18th, you can get the entire collection for $9.50. That is 57% off the regular sale price. If that's not a screaming deal, I don't know what is. 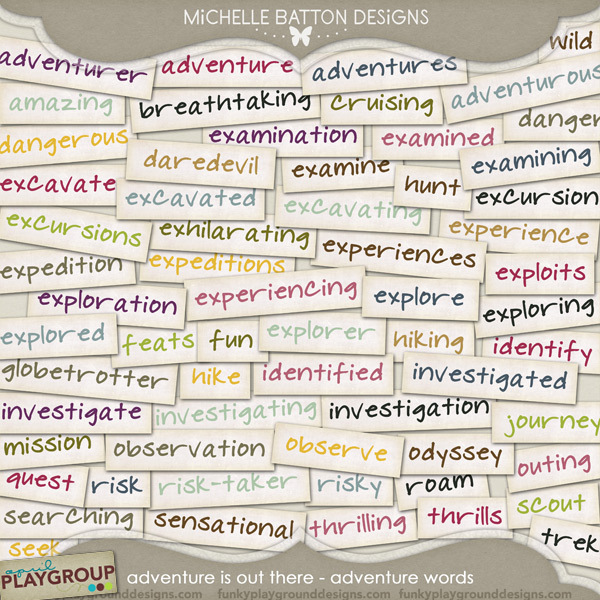 And here is another layout using the Adventure Is Out There Collection. And this one is not travel related. This kit can definitely be used for all types of layouts. 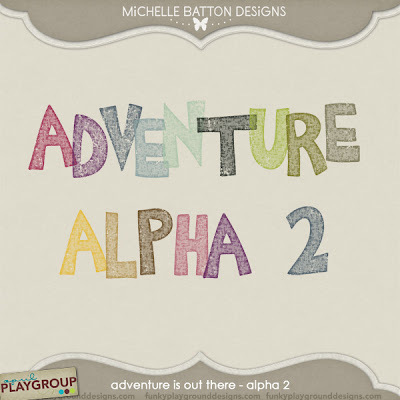 I highly recommend heading straight to FunkyPlaygroundDesigns to check out Michelle's Adventure is Out There collection and all of the kits that are a part of this month's Academy Awards Inspired Playgroup. When David and I were out at 10 Mile Creek on Saturday, I actually managed to get a photo of David where he is smiling and his eyes are actually open. If you look at the photos I scrap of him, you'll know that this is a rare fete. Needless to say, I had to scrap it. The layout was created using On The Go and Scatter It Templates from Merkeley Designs. 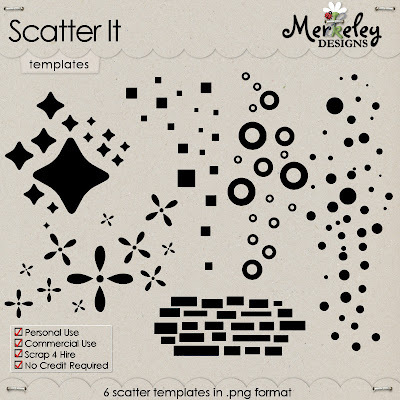 I used the Scatter It Templates to create the cutouts in the top paper. The font I used is Boring Showers. I have to say that I have found On The Go to be a very versatile kit. This is the second layout I've created in the last month using this kit and I've created others as well. On The Go is considered a mini kit, but I have gotten more than a little use out of it. Hope you enjoyed looking at my layout. 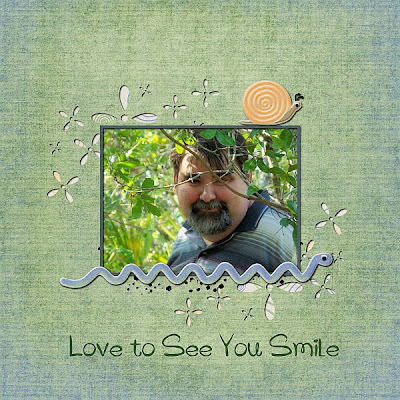 I always enjoy creating layouts that feature my sweetie, David. Until next time, don't forget to take a picture. Have you seen the latest collab from FunkyPlaygroundDesigns? It is absolutely gorgeous. 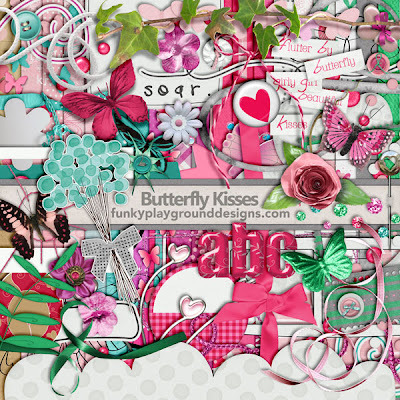 Butterfly Kisses is perfect for all those Spring layouts and those layouts that just need a more feminine touch. And this kit is just packed with goodness. Here is what you can find in the kit. And normally, Butterfly Kisses costs $7.00. And at $7.00 it is a great value. But through today, you can pick up Butterfly Kisses for only $3.50. Now that is a good deal. This month, Butterfly Kisses is also available as part of a collection that contains 12 quickpages and 4 page starters. So if you are creating layouts on the run, this is the collection for you. Of course, you can also pickup the page starters and the quickpages separately. I created one of the Butterfly Kisses quickpages. Here is my layout using that quickpage. I hope you'll stop by the store and check this kit out. You can also head on over to the FunkyPlaygroundDesigns gallery to see some fabulous layouts created using Butterfly Kisses. Do you know how David and I met? Well, for those who don't know, I am here to tell you. David and I met in an IRC chatroom on Dalnet. That's right David and I met on the Internet. It was the Summer of 2000. I was watching the Democratic National Convention (yes, I do things like that) and chatting in #mormon-friends with Randy (wolffarmer) about what was being said. David was in the same chatroom, but he and I really hadn't met. (At the time, #mormon-friends was a very active chatroom.) However, he was very impressed by my discussion with wolffarmer, so he decided to send me a private chat. And that is when I began chatting with David. After David and had chatted for a couple of weeks, we began talking on the phone. The whole time we were saying we just wanted to be friends that is all. And then we started planning a visit for David (who lived in Florida) to fly out to Texas to meet me. David flew in to DFW airport on Thursday, October 12, 2000 and we met in person for the first time. It was a short visit as he had to go get his car and our first date wasn't until the next night. While it was a short visit, it is a very important date as it is the day I met David in real life. 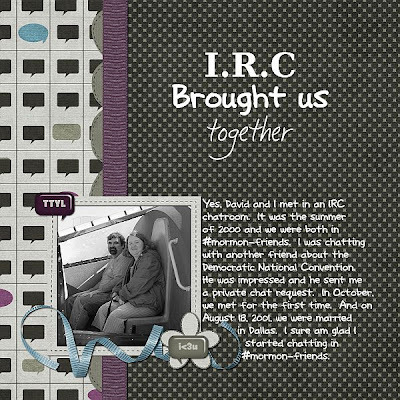 Here is a layout I created about David and I meeting in an IRC chatroom. 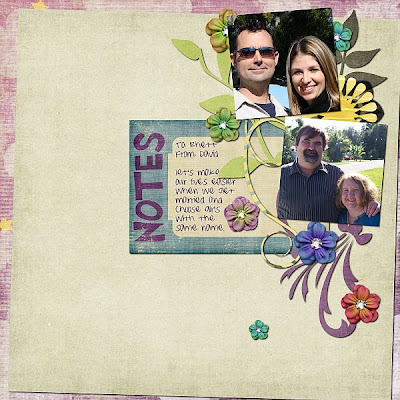 The layout was created using Funky Club Vol 2, Week 14 by Amanda Carlson. I'll be back another day to tell you about our first date. Then you'll know why our meeting on 10/12 ended up being so crucial. If you read the My Favorite Podcasts post that I did back in September of 2009, then you know I love listening to podcasts in the car. And one of my favorite podcasts, up until recently, has always been Buzz Out Loud. I could keep up with the latest tech news, one of my obsessions, with a podcast that was not only relevant but funny. I thought the podcast team of Tom Merritt, Molly Wood and Jason Howell (aka JaMoTo) was just about perfect. I started every weekday listening to the Buzz Out Loud podcast from the previous day. But change happens and about a year ago Tom Merritt moved from CNET to TWiT. Tom was replaced by Rafe Needleman. Rafe was no Tom but it was still my favorite podcast. Within two or three months of Tom Merritt moving to TWiT, Jason Howell made the same move in order to produce Tech News Today for Tom. I hated to see him make that move because that put an end to the last vestiges of JaMoTo. But even with that change, I still considered Buzz Out Loud my favorite podcast. And then the change happened that broke Buzz Out Loud, Rafe was replaced by Brian Tong. I'd love to know why that change was made, because it ruined my favorite podcast. I love Molly Wood. Brian Tong, with a host other than Molly, I can handle. But I do not like the combination of Molly and Brian. Since Molly and Brian became co-hosts, Buzz Out Loud has become some weird combination of the old Gadgettes show and Buzz Out Loud. And it's not that I didn't love Gadgettes. I absolutely hated to see that show come to an end. I loved the silliness of it and how it could be over-the-top. But you know what, Gadgettes was definitely not a family friendly show. That doesn't mean I didn't love the show, but I won't pretend that it was family friendly either. However, Buzz Out Loud was up until recently. If it wasn't for the fact that I am a fan of Molly Wood, I would have given up on Buzz Out Loud long ago. And if I didn't ride to work with my husband, who prefers Buzz Out Loud, Tech News Today would now be my first podcast of the day. I would only listen to Buzz Out Loud when I had extra time. I know that Buzz Out Loud is not going to return to being hosted by Tom, Molly and Jason. But if someone at CNET could find a new co-host for Molly I would really appreciate it. 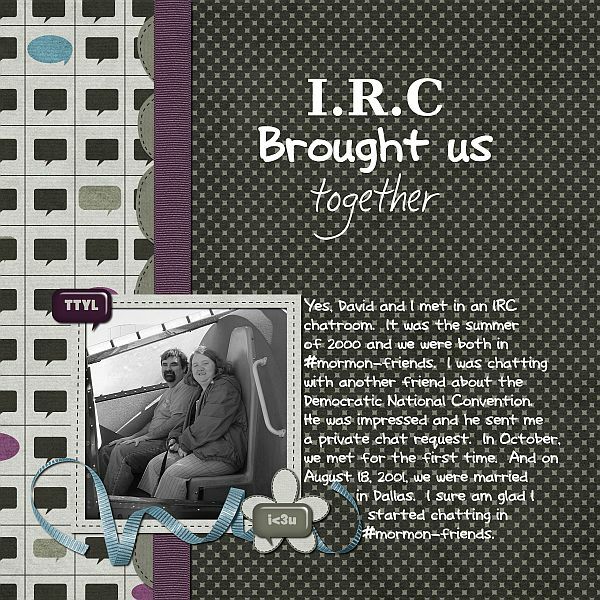 If you are like me, you will have times when you are just scrapbooking like crazy. You are just putting out a layout or two every day or so. And then *boom* the mojo monster strikes and yours is gone. When that happens to me, and it happens a little too often, then I start looking for ideas to get myself going again. I am on four creative teams, so I can't afford for my mojo to be gone for too long. One of the places I turn when I need a little extra help is templates. 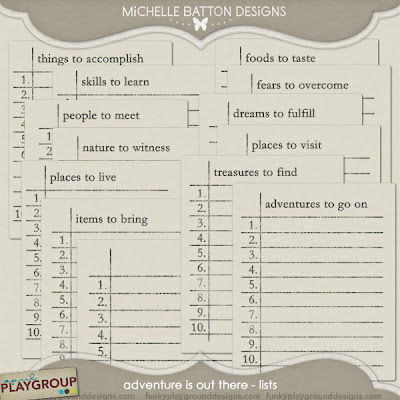 Templates are such a great way to help you get started with a new layout. Plus they are so versatile. You can use a template "as is" or you can can rework it to fit the photos or your personal style. You can really make a template "yours". And Recherche by KH Designs has some new templates that I think you are really gonna like. 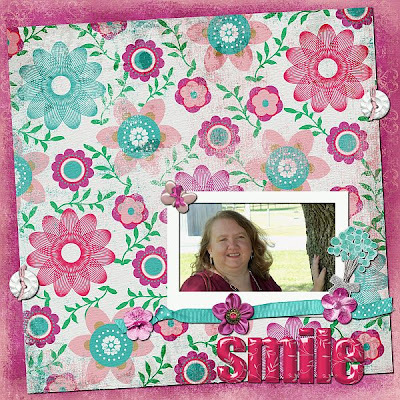 Her latest templates are Tempting Starts Volume 1 and what makes them really cool is that each template comes with a glitter element that you can save to use on other layouts. I've already created one layout using these templates. And I have at least one more planned, maybe two. Just depends on how this coming week goes. 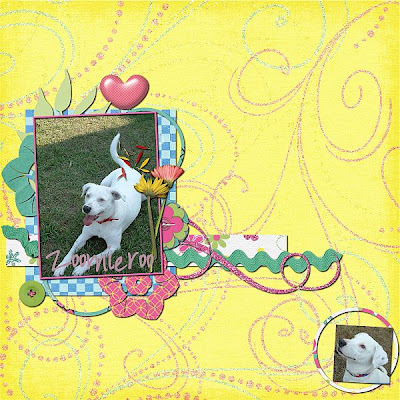 My first layout features my sweet dog Sazume. She is such a sweetheart that she deserves lots of layout featuring her cute face. I know a lot of us are working like made on ADSR 6, but I still recommend taking a breather and heading over to FunkyPlaygroundDesigns to checkout these templates. I actually took way more than one photo this week. I took plenty on our hike yesterday. But I will be sharing those later. My official photos for this week were taken during our lunchtime trip to a local park. These have not been edited at all because I wanted to get them up this evening. To save money and calories, we've been eating out a lot less. When the weather is nice, we like to spend our lunch at a park near our office. The park is right on the water. There are benches on a little walkway near the water plus some eating areas in the park itself. I'll read a book on my Kindle while David plays on his phone. While at the park, I took the two photos of the boats docked near the park. I also grabbed a shot of David. As far as I am concerned I can never have too many of those. I know that there were several points made in last week's Conference that I really need to work on. And there were also several messages that just really moved me. I am so glad I took the time to listen to all four general sessions. Here is another one of my favorite points from Elder Holland's talk. If you missed Elder Holland's talk last week, I highly recommend taking the time to read it or listen to it now. And if you did here his talk, And even if you did listen, his talk is worth reviewing. 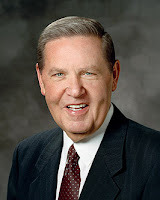 Below, are links to read and to listen to the talk Elder Holland gave.